A Ventoso in GTA Vice City Stories. 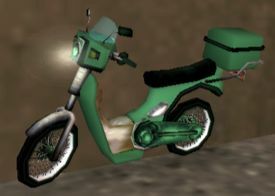 The Ventoso is a moped featured in Grand Theft Auto: Vice City Stories. Weak in engine power, the Ventoso's performance is no different from that of the Faggio scooter, being slow but compensates with moderate-to-good steering (due to its speed). Based on a late 1970s moped or underbone (a vehicle class nestled between those of conventional motorbikes and the scooters), the Ventoso is evidently distinguishable by its compact framing and comes with a back-mounted, hard cover pannier, similar to the Pizza Boy. In the PlayStation 2 version of the game, a bulletproof Ventoso can be purchased by picking up a icon next to King Knuts in Downtown for $2,500. During the mission Conduct Unbecoming, after Victor Vance comes out of Fort Baxter Air Base, it is parked next to the gates. During the mission The Bum Deal, Bryan Forbes escapes Victor Vance on this vehicle. Occasionally seen driving around Vice Point. This page was last modified on 6 August 2012, at 22:58.